Sir Arthur Clarke used to say this when my daughter Dhara and I presented him flowers every year on his birthday, 16 December. Dhara has grown up carrying flowers to Uncle Arthur all her life. Had Sir Arthur been alive, he would have been 92 today. It now becomes his 92nd birth anniversary. Although Sir Arthur has headed for the stars, Dhara and I still continue our annual tradition. 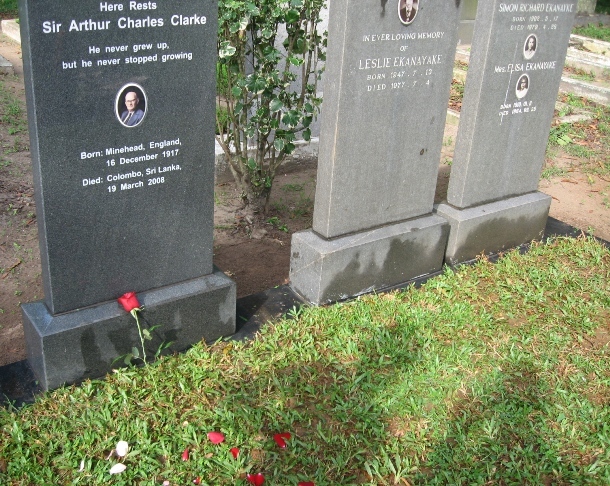 We now take him flowers not to Leslie’s House, Sir Arthur’s Colombo home for over 35 years, but to his grave at Colombo’s general cemetery. With a few red and pink roses in hand, we walked through the cemetery’s narrow pathways this morning. 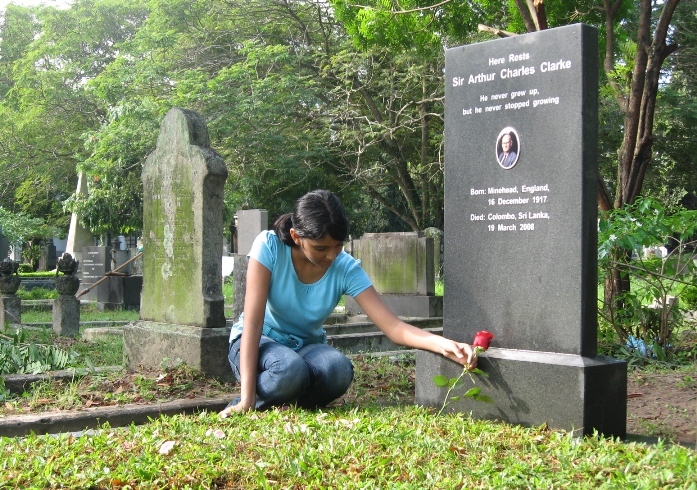 Last December, when we first made this journey, Sir Arthur’s grave was as yet unmarked, and could be located only if we looked for the graves of the departed Ekanayakes, members of his adopted Lankan family. ‘Here rests Sir Arthur Charles Clarke. And unlike last year, when the gravesite had only a concrete surface, some grass is now growing there. We broke up the roses and sprinkled the petals on the grass. We left the last red rose in tact, nestled against the tombstone.